Bright and Breezy Crafts: It's Wedding season! 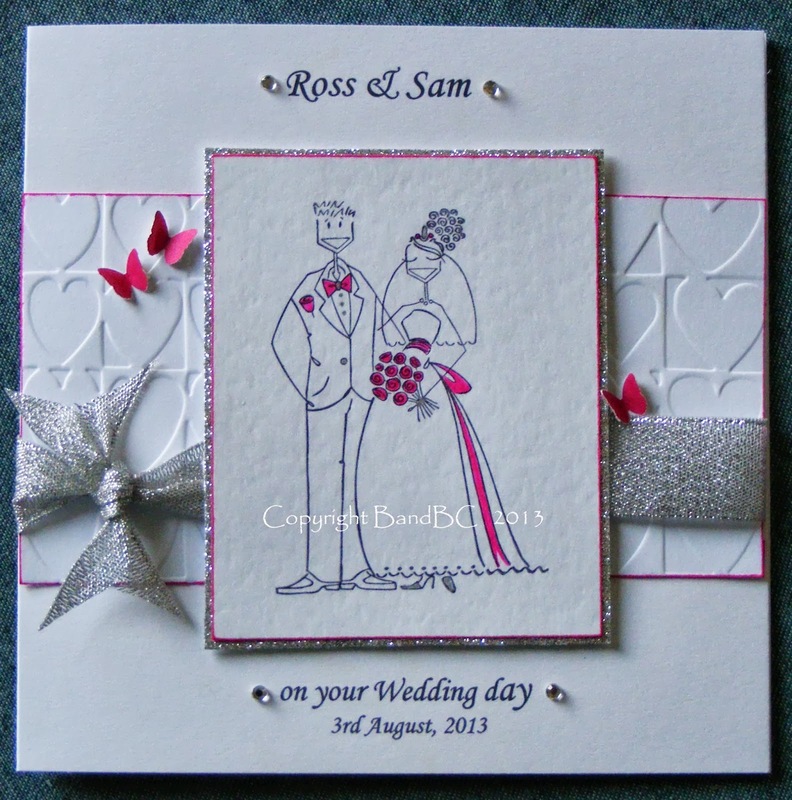 I was asked to make a card with the wedding colours...silver and fushia pink. I think the image is stampin bella...but don't quote me on that. 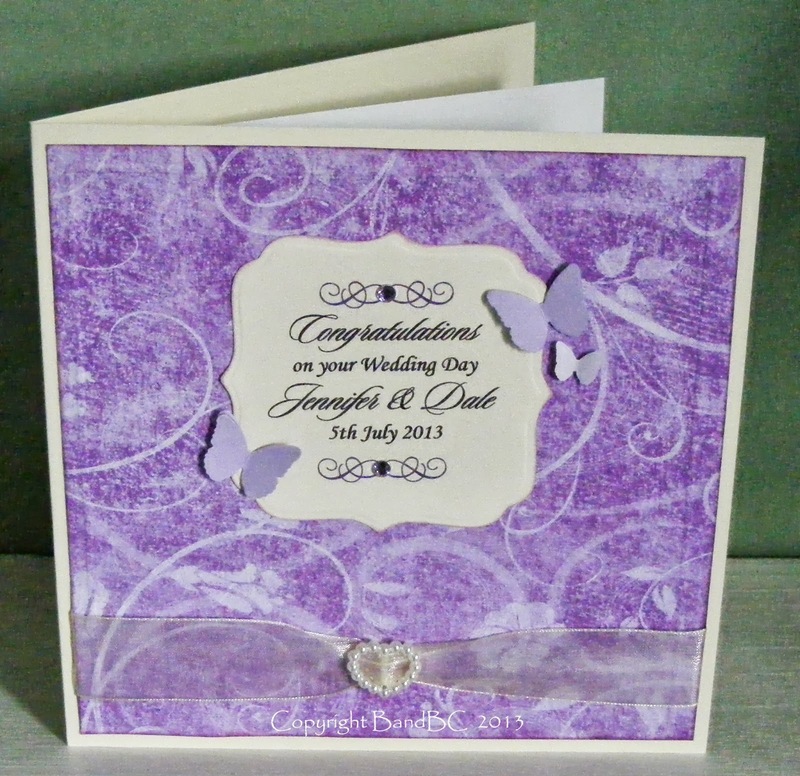 Sentiments printed directly onto card. Embossed hearts background done on my bigshot. Silver ribbon leftover from a box of chocs, I think! the wedding was on July 5th! Lol! "funky fairies" - sadly, no longer online. Added a couple of MS butterflies and a little heart buckle and ribbon. Inked and embossed round the edge of the purple paper, to finish. Yet another docrafts paper was used for the backing of this card.. I like the confetti look of the paper. and pink petticoat image directly onto it. and another little heart buckle, threaded with ribbon. 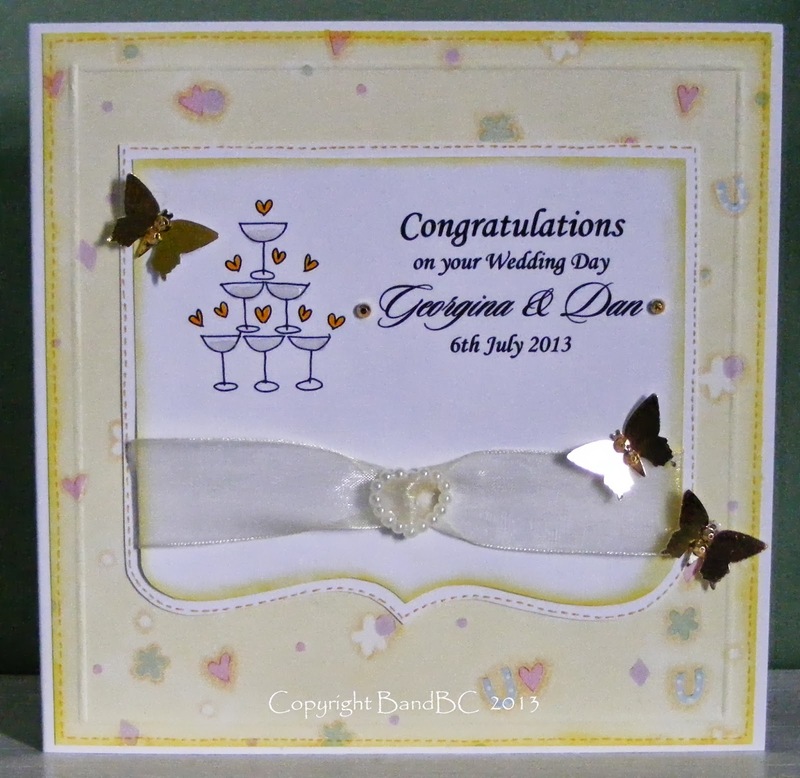 Woodware punched butterflies in gold, finish off this card. wow these are fabulous . Love them all but the purple is my fav colour. 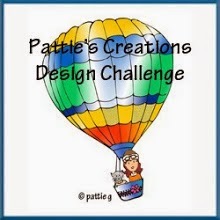 Thanks for sharing with us at glitternsparkle . You are SO talented, each of these cards is gorgeous! I Love the pops of colour on the first, and the butterflies on each of these are the perfect finishing touch. Thanks you for playing along with us at Opus Gluei, it's a real treat to see your wedding cards! 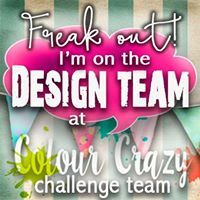 Wow - you've been very busy! 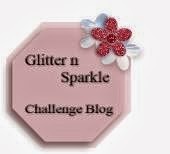 The card you've entered at Glitter n Sparkle Challenge Blog fits our Wedding theme perfectly. Your attention to detail is wonderful - I especially love your embellishments: the ribbon with heart - and the gold butterflies. Just lovely! Thank you for joining us and I hope to see you again soon. P.S. I have candy on my blog. 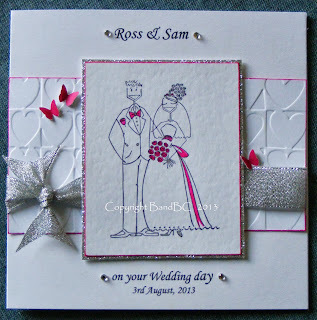 Beautiful Wedding cards...Thanks for playing along with us at Di's Digi Designs Challenge this fortnight. fab cards,love the purple card. Lovely cards - all of them - but I have a partiality for the first because the wedding day is my birthday! I also love the touch of pink and the fact that you have recycled stuff. A really lovely set of cards. I hope you do well in the challenges. Three gorgeous cards, my favourite has to be the top one though! A great set of cards. You have been busy. What lovely cards you've made here, for some very lucky couples. I love that each has a distinct feel to it. I think I absolutely love the purple paper you used on the second card and the heart buckle adds such an elegant touch. Thank you so much for playing with us at Opus Gluei, you really made beautiful WEDDING themed cards to share with us! So pretty, thanks for playing along with us at Paper Playtime!! Those dreaded cards...cards for men/ boys!